A few million miles away from Los Angeles, danger is lurking. 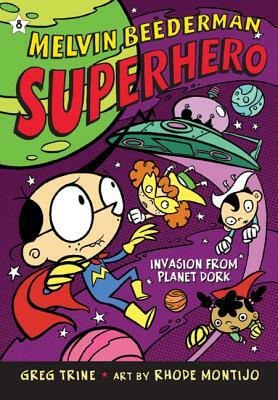 Evil aliens with some seriously hard to pronounce names like Zzykrkv are visiting earth from their home planet, Dork—to kidnap earthlings for their science class! While busy on a snack food errand . . . uh, mission . . . Melvin Beederman, official superhero of Los Angeles, senses that something doesn't feel quite right. Can Melvin, Candance, and friends from the Superhero Academy prevail over extraterrestrial bad guys with a spaceship powered by a Gamma drive? Holy alien invasion!